HBO has a pretty cool program where they are looking for filmmakers from diverse backgrounds to make short films. The application seems pretty straightforward, there are two questions. Here’s the second one, which is admittedly inadvertently hilarious. And here’s my answer, with 4 words to spare. It’s hard to say how my diversity has worked to my advantage. That’s not to discount the possibility/certainty that it has worked both for (and against) me. It’s just to suggest that always having been “diverse”, it’s impossible to know what my circumstances would have looked like in the absence of said diversity. The truth is most of the tales I hear from “the other side” lead me to believe that my diversity has given me a different set of stories. Not unilaterally better or worse stories, just different. When I was 11, my parents sent me to camp Eagles Nest in North Carolina. This was a three week sleep-away camp, where you learn to do super hippie things like ride horses, kick hackey sacks, and sing Joni Mitchell songs. You know. White People Stuff (TM). Luckily, I wasn’t the only black kid at camp because my parents sent my little brother too. This is a picture from ENC of how we ended every single day. Seriously. One day, after a white-water canoeing trip we were tasked with the loathsome responsibility of loading the canoes back onto the carrier. If you’ve never been an eleven year old carrying a wooden canoe on your head in the hot North Carolina sun, it’s a safe bet that you never will be, so I’ll just tell you: It’s miserable. It’s so miserable that it makes you wonder whether the fun you had canoeing was enough to offset the un-fun you had un-canoeing. 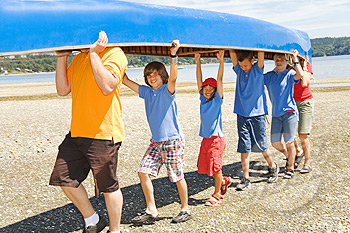 Kids Carrying a Canoe with smiles, but no diversity. As we loaded the canoes an old pick-up truck appeared on the isolated dirt road. The truck slowed down as it drew closer, and the driver stared at us. More specifically, he stared at me. The truck pulled to a stop by the counselors, two college kids in their early 20s. He asked them a question that college hadn’t prepared them for. Then he did a u-turn and drove back toward us. The counselors had been trained for first-aid, CPR, and homesickness. Racial threats and drive-bys (Black People Stuff (TM)) hadn’t been part of the orientation, so they said what you would’ve said. I’d like to tell you that I was terrified. It’d be great drama if I’d cried, or shaken, and needed to talk to the camp guidance counselor for days to get over the enormity of what happened. The truth was? I was eleven years old — I thought it was awesome. First of all, I had been singled out. That made me SPECIAL. More special than the other kids. Second, I’d been assigned a mission: Run to the van. Eleven year old kids are never given real missions and based on my counselors’s facial expressions, my mission was pretty important. Third, and most important to me at the time, I didn’t have to carry any more canoes. Now, looking back? I feel terrified for younger me. I also feel badly for the adults. At twenty, I would’ve probably frozen with the inverse situation (“Y’all know y’all got a cracker with y’all?” ) and would probably be wracked with guilt over the fact that I needed to keep the other kids around to help me load up those canoes. I guess my diversity got me out of some manual labor (there’s a first), and gave me another story. The question asked about the “advantage of diversity” Well.. I’m not entirely sure what that means, but consider this. There are a number of people in that exchange who all have stories to tell. The kids. The counselors. Even the racist. (“If not for that van…”) We all have different vantages. If this story were a movie, wouldn’t you want to watch it from the perspective of the kid in the van? Phil, as always, you demonstrate literary talent and wit that needs to be exposed to the masses. And one day it will, I have no doubt about that. Keep writing, I check this blog every now and then and was pleasantly surprised to see a 2014 entry. Hopefully there will be more things to write about as the year progresses. Phil – You never cease to disappoint. I told you I always stop my scrolling when I get to one of your posts because I know it will entertain, make me think, or maybe both. Keep it up friend. Super proud of you!